Undergraduate students (from left to right) David Leventhal, Emily Craig, Meghan Russell, and Kali Williams. Undergraduate students from the UT Department of Geography recently attended the Tennessee Geographic Information Council (TNGIC) Eastern Regional Meeting in Kingsport, Tennessee. TNGIC is the state professional organization that supports geospatial technology across Tennessee by hosting data, leading workshops, hosting conferences, and keeping members informed of updates to data, laws, and best practices. Students David Leventhal, Meghan Russell, and Kali Williams presented their map, The Geography of Opiate Abuse, Overdose, and Treatment in Tennessee, as part of the map gallery depicting hot spots of opiate prescription and overdose surrounding Knox County. 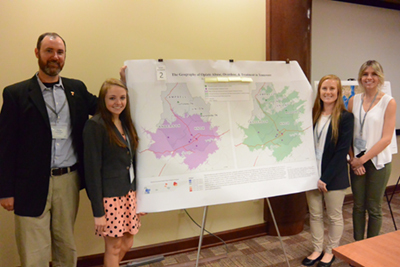 Students used Geographic Information Systems (GIS) software to analyze the areas in Knox, Campbell, Union, and Anderson Counties with and without access to in-patient treatment centers, and based on their analysis, made recommendations for where new treatment centers should be located to increase accessibility. The map won two awards: Best Data Integration and Viewer’s Choice. Also in attendance was undergraduate student Emily Craig. Emily serves as the student liaison to the TNGIC Board of Directors. She will spend the academic year working to increase student participation in regional and state TNGIC trainings, workshops, and conferences. Emily is coordinating communications among the community colleges and universities across Tennessee that offer geospatial courses, organizing student volunteers for the spring TNGIC meeting, and other activities to promote TNGIC membership to the next generation of geospatial professionals. Several alumni of the UT geography program attended the meeting, including Ian Feathers, who currently works for ESRI, and Paul Dudley, who works for the state coordinating geospatial data acquisition and distribution.